Sometimes you stumble onto something by accident that you just have to share! That’s exactly how this new fluffy oobleck slime recipe developed. 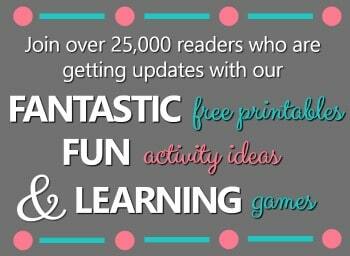 We do a ton of sensory play at home, and we share many of our play dough and small world ideas on this site. However, we use most of our slime and other play recipes from the experts instead of recreating the wheel. Often my kids takeover with the play and add in their own unique twists. Their sense of wonder led to this amazingly fluffy and smooth new substance. 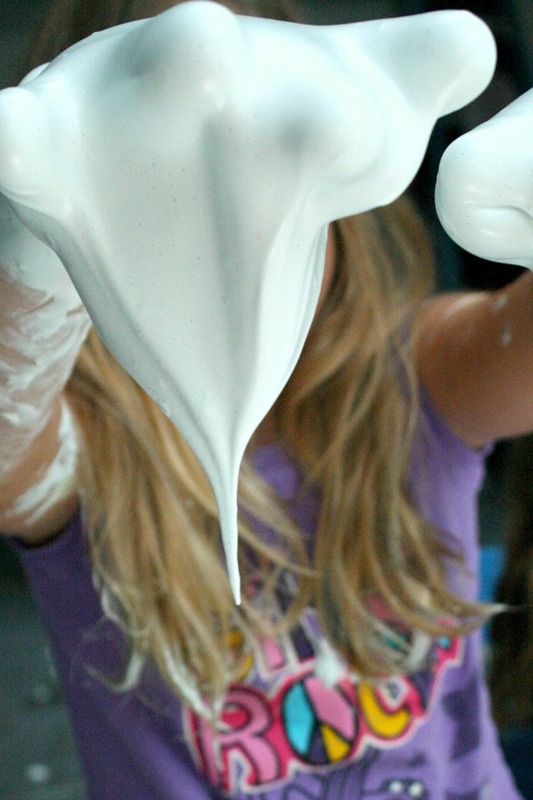 We weren’t exactly sure what to call it because it’s not quite oobleck, and it’s not quite slime. It is,however, irresistable to play with, so go ahead and make your own. Then check back and let us know if you’d recommend a different name for it! 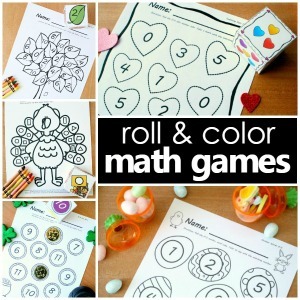 We started by playing with the colorful and fun rainbow foam dough from Fun at Home with Kids. We’ve made it many times, and it’s always a hit if you want to try it out! As the kids finished playing I heard, “I wonder what would happen if…” And of course my teacher mama heart skipped a beat as I listened for the next words to come. I just knew we’d be doing something fun that would lead to some learning along the way. 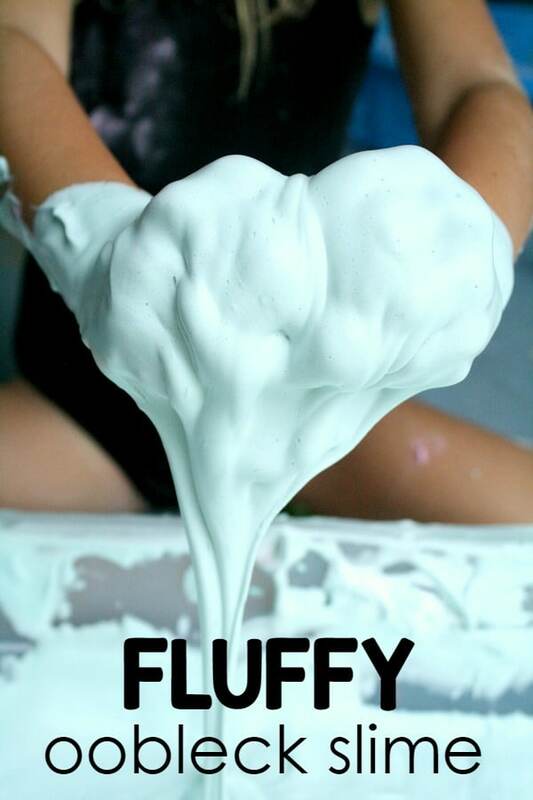 What followed was a bit of an experiment as they added and mixed ingredients, and the result was this fluffy oozing smooth substance that we all just had to play with! Since then we’ve tested it out so that we could write up a recipe for you to try on your own. However, I do recommend that you go slowly through the steps and let the kids mix and tweak as they see fit. 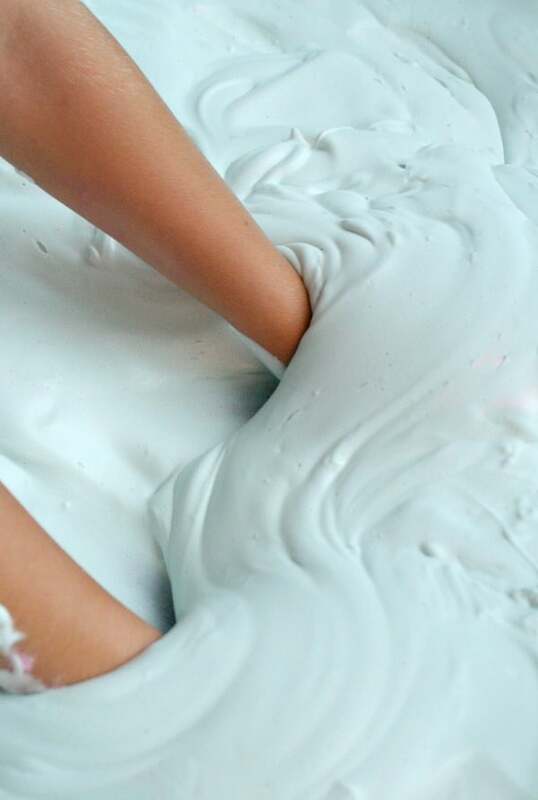 This gives them a chance to touch and explore each of the materials and the different states of matter the ingredients go through as they combine to make fluffy oobleck slime. Start by combining equal parts cornstarch and shaving cream (one with a nice thick consistency and low odor if possible–trust me). This doesn’t have to be exact, but it helps give you an idea of what to aim for. If anything, add a bit more shaving cream than cornstarch. Let kids knead and mix these two items for a while. They’ll be clumpy and marshmallow cloud like. 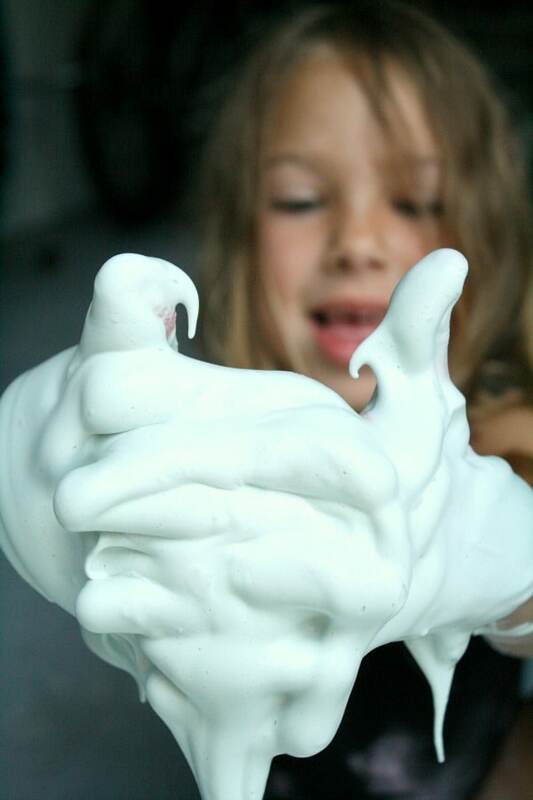 For a good amount of foamy slime we typically use about 16 oz of cornstarch and two bottles of shaving cream, but have extra on hand in case you don’t get the consistency you want. Remember experimenting with the consistency is part of the fun …let kids explore and take the lead when possible even if it doesn’t turn out exactly the same each time! As kids are ready to move on to the next phase add in a bit of water and liquid starch. We added in increments of 1/2 cup water and 1/4 cup liquid starch. You can also add food coloring or liquid watercolors during this step to give your slime some color. Use hands to combine the mixture with the new ingredients. You’ll notice the liquid starch begins to firm up the solution a bit. Wait a minute or two before adding any more. Then decide whether you want it to be more firm or not. 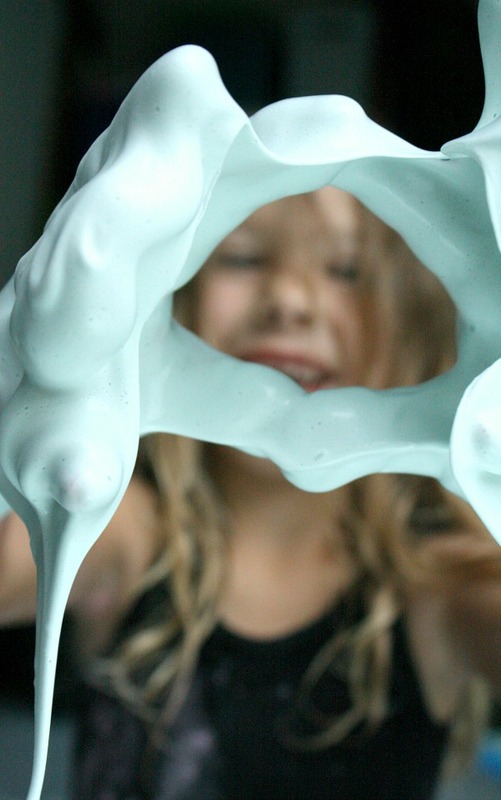 Add in more water to make it less firm and more like oobleck. Add in more liquid starch to make it more firm and more like slime. Once you have the consistency you like it’s time to play! My kids love the feel of this substance, and each time we make it they play for quite a while! They love seeing how it attaches to their hands and then separates slowly. Even I can’t help but want to touch it. It feels amazing! And of course I’m sure you’re wondering about clean up. Personally we do this outside or in our garage so we’re near both a hose and a sink. Sometimes I set out a bin full of water so the kids can wash off right next to the slime bin. Do whatever works for you!